The film tells the story of a family who live on an island in the Seto Inland Sea. The parents of two young boys must struggle to keep their crops watered. They travel to the mainland on a small boat to collect water and transport it back to the island, constantly returning to refill their buckets. We see that the soil on the island soaks up the water almost instantly and the dry summer makes this an interminable and unenviable task as they carry their heavy loads up the hill to their fields. This Sisyphean task comes to represent a more general fight for survival. Director Kaneto Shindo creates a startlingly realistic portrait of rural farm life. At times the film feels more like a documentary as we watch the family carry out their duties. Most of the tension in the film comes from the constant struggle of the family to survive, a struggle that is brought into sharp relief in the final portion of the film when the elder son falls ill. The film moves at a relaxed pace and there is no dialogue or plot to speak of. The seasons change and the family endure. Their island seems at once to be both a paradise and a sort of purgatory where they must continually fight the parched earth to get anything to grow. It can be a chore to watch at times, with little recognizable drama, but in the end it is effective in portraying the simple lives of these people. There are a number of beautiful shots and the score manages to evoke a sense of tranquillity while at the same time foreshadowing the terrible events of the films conclusion. “The Naked Island” is a film that sets out with a clear purpose to show the hardships encountered by those working the land. The island setting is perfect as it shows both the isolation of the family and lends a sense of danger as they are cut off from the rest of the world. The constant need for water comes to symbolise humanities wider struggle for survival against a hostile planet. Also interesting to note is that much of the film seems to portray events from the mother’s perspective. 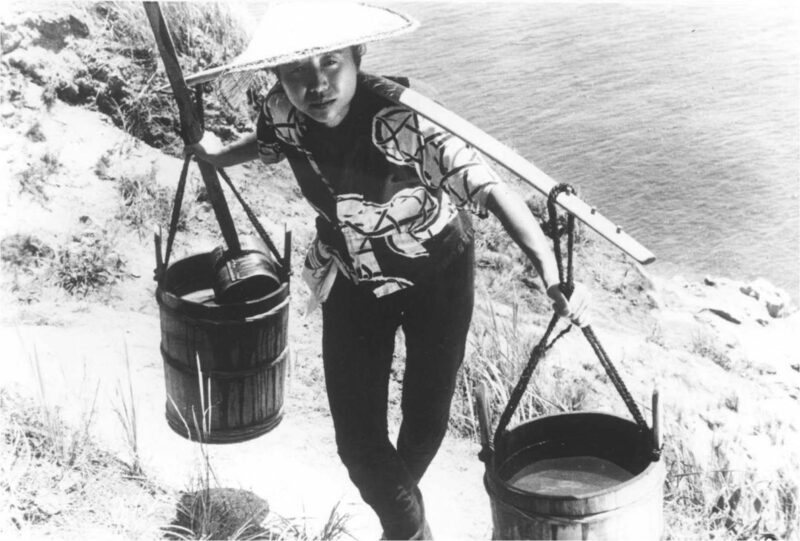 We can see the burden of her water buckets as a metaphor for the stresses placed on her as a woman, a wife and a mother. Overall, it is a great example of film-making from the era. There are many ways to analyse the story and various scenes, but it is also a fantastic window on the past.